"BOLETAS" ( Egyptian Vulture in local language) was formed in 1994. 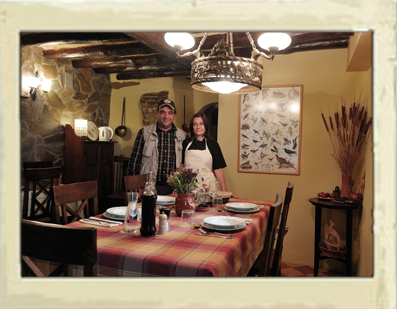 A stroke of luck enabled us to live our long-awaited dream; install ourselves in a small rural village in the midst of one of the best birdwatching areas in the Iberian Peninsula, dedicating ourselves exclusively to our interest in birds while enjoying the special scenery of the Central Pyrenees. In the peaceful village of Loporzano we restored an old house, once a storehouse for wines and oils in the 16th Century, converting it into a Birdwatching Centre & Guest House offering, attentive service, accommodation, excellent food & wine , information and a selection of very well organised tours through Spain, Morocco & other countries . Our doors are open for those naturalists and birdwatchers, guided or independent, who want to visit Spain and need any information about birds, sites or accommodation. We will help you, without any cost, arranging bookings, suggesting best sites or itineraries and giving all necessary information for a successful holiday. If you are travelling or birding around our area and you want to visit BOLETAS Birdwatching Centre,we would be delighted to invite you for a cup of tea or a glass of wine while we share our love for birds. Why have Boletas tours been accepted so well in the competitive Birdwatching market? We appeal to discerning customers, who recognise value for money and good ideas. We are an innovative company, being the first European birdwatching initiative to have had an internet web site - since 1996. We also recognised the benefits to our customers of low cost airlines and the advantages of self-booking. Boletas introduced birdwatching tours for small groups (7/8 people) and individuals alike, providing each customer with exactly what they were looking for - a holiday geared to their personal requirements. We always understand that a birdwatching holiday is not only about birds. We are recognised for organising holidays where landscapes, food & wine and accommodation are important for your full enjoyment. As pioneers our tours are a reference for other companies and many birdwatchers. We always try to be one step ahead and thanks to this we are still developing new and attractive tours. For those who book with us for the first time you will need to know what the major benefits of our tours are. It is our aim to offer you at a very interesting price, the best holidays in the most beautiful nature areas of Spain; the dramatic Pyrenees,the interesting Ebro valley steppes and Ebro Delta , the unknown Picos de Europa and the famous Extremadura and Doñana. 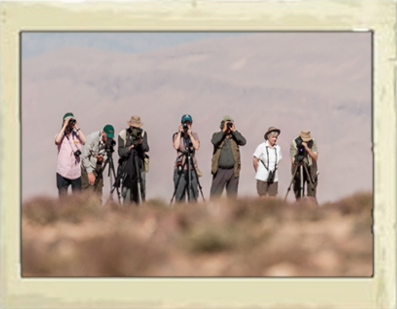 In recent we consider we have become pioneers in tours to Morocco - agtruly exotic and excelelnt birding destination. Our tours have been designed for very small groups with a maximum of 12 people with two guides (singles, retired couples, groups of friends, etc.) which enables us to provide great personal attention in order that you fully enjoy the selected itineraries that we have designed. Our leaders, expert birders and full-time professionals with excellent interpersonal communication skills and enthusiasm, are highly qualified to conduct groups and have a wide knowledge in natural history. With them you will fully appreciate the natural and cultural aspects of the different proposed sites. The convenience of providing a spacious and comfortable mini-bus allows us to show you the most unknown sites with an itinerary according to the interest and characteristics of our clients who request special attention to photography, butterflies and botany. We are the most successful and reputable Spanish birdwatching company, having organised and guided more than 200 tours throughout Spain, Morocco and other destinations. We invite you to visit the ‘OUR GUESTS' section of this website and see what our customers say of their experiences with us. We consider our offer to be one of the most interesting, solid and well-researched that you can find in today´s large birdwatching holiday market. We have no doubt that if you eventually choose to put your confidence in us, you will find unbeatable service and professional planning, the keys to a very special and fruitful holiday in Spain and elsewhere.